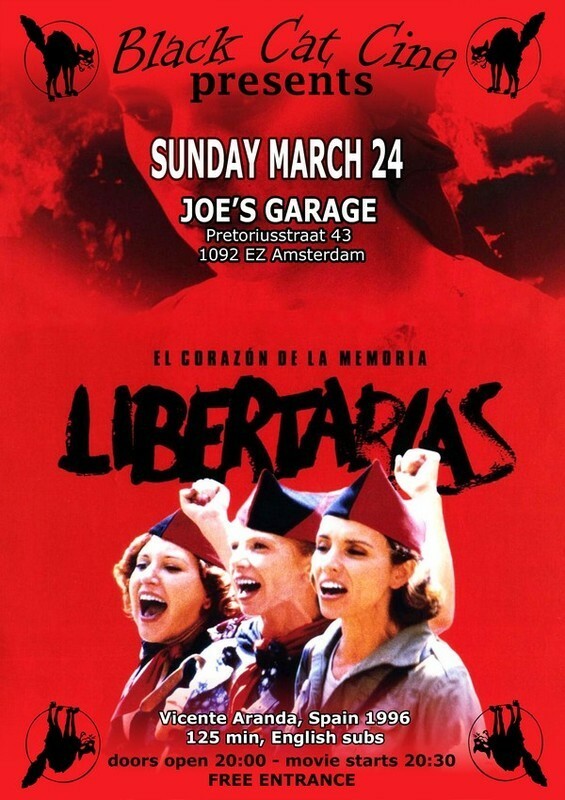 Sunday March 24th 2019, Libertarias (Vicente Aranda, 1996), 131 minutes, in Spanish with English subtitles. Doors open at 20.00, film at 20.30. Spain, 19 July 1936. The revolution has begun in a city near Barcelona. María, an innocent young nun, flees her convent when revolutionaries invade the area and finds refuge in a brothel. 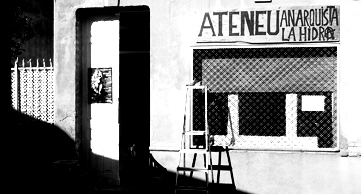 Here she meets a group of “Libertarias,” anarchist militia women who are fighting not only Franco, but also the conservative attitudes toward women that prevail as well in the revolutionary ranks. The group is led by hard-liner Pilar, whose seconds-in-command are the clairvoyent Floren and the big-hearted prostitute Concha. Pilar quickly feels a strange fascination for this young nun whose father is a fascist. On their way to the front, the group runs into a defrocked priest who joins up with them and falls in love with María. There are three main locations: the vicinity of Barcelona, the trenches, and Saragossa. Aranda describes the daily existence of these anarchist freedom fighters, not without a touch of humor, as in the scene when Floren does an imitation of Linda Blair in The Exorcist. When the protagonists arrive in Saragossa, the streets are strewn with bodies and weeping women. María catches her first glimpse of the face of war and her sympathies, despite her background, go out to the freedom fighters. The defrocked priest arrive with the strange news that the anarchist leader Durutti has forbidden women to go to the front: the militarisation of politics has won out over utopian ideals. 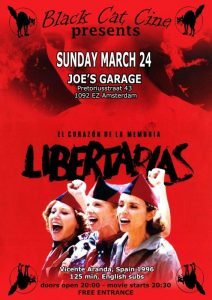 Libertarias is an epic of sorts that mixes documentary, tragedy, romance, comedy, objectivity and introspection in order to dramatize not only a war for freedom, but also a more underground struggle, the war between the sexes. “The 9 from Vilanova” are a group of 9 people that have been arrested in Vilanova i la G., Spain. 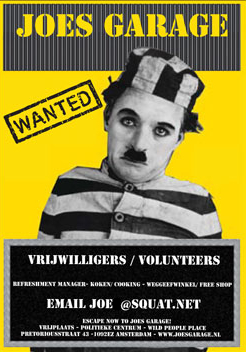 They face sentences of 4 to 8 years, plus fines up to 3.000€ (in total 29years and 10.000€ in fines). They were arrested after an action where the citizens were giving a less than warm welcome to the Minister of the Economy and Treasury (head of the tax office) from the PP (populist party), when he paid a visit to the city, during the European elections. The popular demonstration will be in June, as well as the court case. 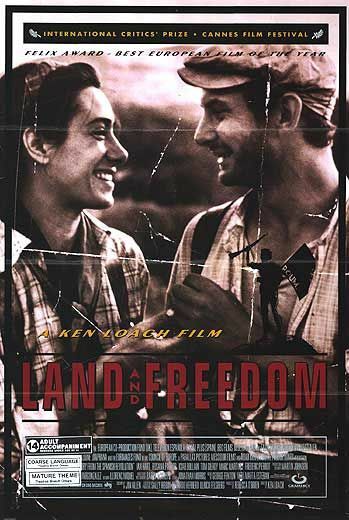 Sunday March 6th 2016, Black Cat Cine presents Land and Freedom (Tierra y Libertad) by Ken Loach, UK 1995, 109 minutes, English subtitles. Door opens at 8pm, film begin at 9pm. Free admission. A fascinating depiction of the Spanish Civil War and the internal struggle between different factions (Stalinist, Marxist, anarchist). David Carr from Liverpool, the protagonist, wants to join the International Brigades but coincidentally ends up enlisted in an anti-soviet POUM militia on the Aragon front. Master of social engagement movie director Ken Loach creates a strong and deeply moving portrait of young people involved in the horrors of civil war and shows how a clash of convictions can destroy a movement from within. Interesting to know: according to Ken Loach, the most important scene of the film is the debate in an assembly of a village successfully liberated by the militia. 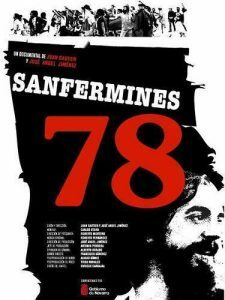 People from the actual village where the film was shot play peasant parts and express their thoughts freely (despite language difficulties), and a debate ensues about whether or not to collectivize the village land and that of a recently shot priest. 19:00 Door opens, Volkseten Vegazulu, 7pm. 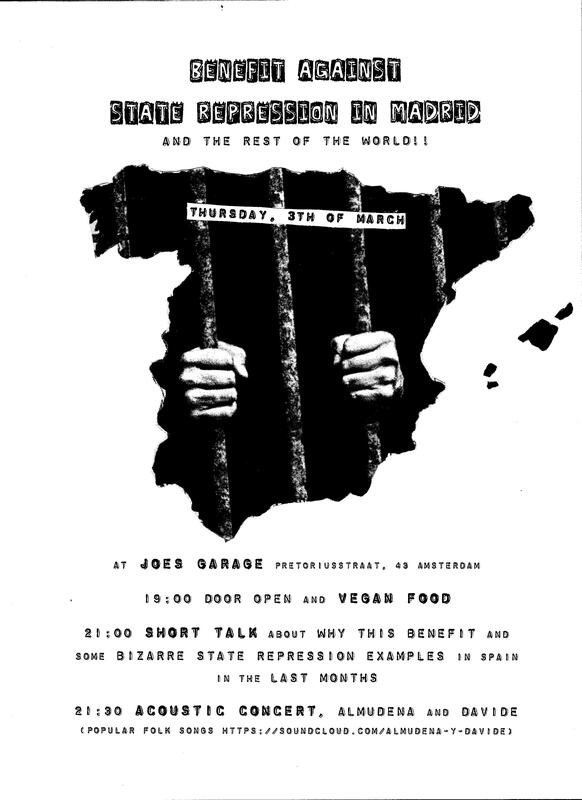 At 21:00 short talk about why this benefit and some bizarre state repression examples in Spain from the last months. On March 17th 2012, Javier, a member of the 15-M movement and the CNT Union, was arrested while filming a racist round-up in Lavapiés, Madrid. In the coming weeks we will know the exact date of the trial, scheduled for the spring, in which the state prosecutor and the private attorney of one of the officers who assaulted him during his detention charge our comrade with resisting arrest and assault & battery, crimes punishable with two years in prison and civil penalty of more than €7,500. The events for which he will go to trial occurred almost four years ago, when a spontaneous demonstration of neighbors tried to publicly denounce the umpteenth racist police raid in the streets of Lavapiés. Peaceful demonstrations like this had already occurred several times in that neighborhood and other quarters with high migrant populations such as Carabanchel, showing that residents had grown weary of the constant police harassment of migrant workers, who suffer identity checks on a daily basis merely for having a dark skin color. Although successive Spanish governments have been reproached for these raids by organizations which are far from revolutionary, such as the EU, the UN, and Amnesty International, they are still occurring every day in the public spaces of our city, with the active collaboration of the Madrid municipal police and private security agents on the subway, commuter trains, etc. They intend to fill the quota for people without residence permits which the Spanish Interior Ministry requires of police department to satisfy their goal of human bodies in their cells, their Immigrant Detention Centers and on their deportation flights, and at the same time, to incite to hatred and divide the native and foreign sections of the working class. March 17, 2012 was a turning point in escalating repression against neighborhood anti-racist self-organization. An unprecedented police deployment and the subsequent police set-up of our comrade Javier tried to put an end to these spontaneous and peaceful demonstrations of solidarity which were marked by chants of “No human being is illegal!”. The authorities want to put an end to the emerging solidarity movement against the scourge of ethnic identity checks and subsequent arrests (kidnapping) of neighbors whose only “crime” was to be migrants, poor and to have lost or failed to complete the administrative process to establish their legal residence in our neighborhoods. The Assembly of Lavapies is taking the opportunity of this new political trial to appeal for solidarity with our comrade and to renew the fight against racist police controls and raids. Watch out for updated information on the trial and support grassroots organizing, without leaders. Don’t let the police continue to undermine coexistence in our neighborhoods with their racist practices. Racists aren’t welcome in our neighborhoods!! 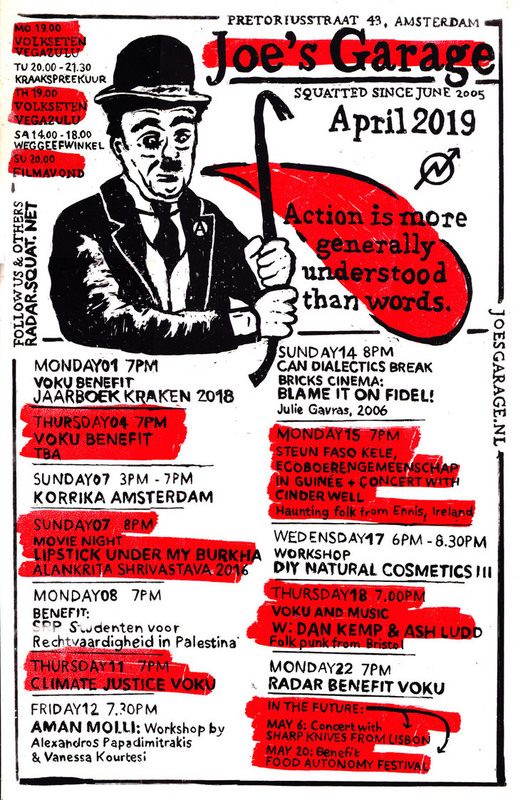 Thursday September 17th 2015, Benefit for the legal costs for the 6 arrested people on June 13th 2015. Volkseten Vegazulu, 7pm. Call for solidarity! 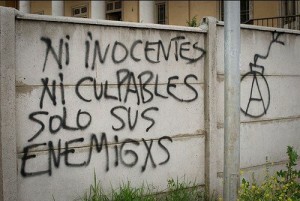 In recent months a wave of repression has hit Spain. A package of laws, limiting basic human rights, including freedom of speech and freedom of assembly has been passed, the so-called ‘Ley Mordaza’ (‘gag law’). Two massive police operations, ironically named ‘Pandora’ and ‘Piñata’ have resulted in multiple arrests, house raids, confiscation of electronic equipment and several charges of terrorism. As a response, several anti-repression demonstrations have taken place, with the most recent resulting in 6 arrests and charges including civil disobedience and possession of explosives. In addition to this, there has been a series of evictions of social centers and harassment from police, which has made fund raising all the more difficult. The situation has reached extremes in which, for example, anti-repression fund-raising accounts have been blocked. International solidarity is needed, especially at a financial level. Nuestra mejor arma: La Solidaridad!